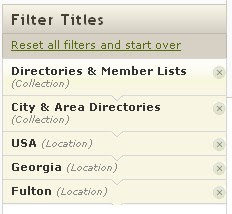 I get the above results when I enter "Atlanta Directory" in the keyword search in the card catalog. Same results including something that has nothing to do with Atlanta, the "Baronia anglica concentrata, or, A concentrated account of all the baronies commonly called baronies in fee." Whatever. So this time, after I filtered by 'Directories & Member Lists' I chose the first option in the list which was 'U.S. City Directories' which has over 6 million records. The search on this screen is useless and if anyone knows how to get good results from it, I'm all ears. When I tried to search for 'Tuggle' in 'Atlanta' with an exact match I got no results. When I turned off the exact matches for 'Atlanta' I got 2,766 results starting with New York. So that's a complete waste of time. From here it's easy to get to the correct year, but then you lose the ability to search that specific volume. So you have to browse through it and load all the images until you get to the right page. This is a terrible way to go through a City Directory because you can miss so much important information like the street listing or the business section. I even tried to copy and paste the titles into the title and keyword search boxes in the card catalog but obviously that didn't work. The good news is that these are fairly good scans and I don't believe I had anything prior to 1887 at the library. I wonder how many other important titles I've been missing on Ancestry.com because they are impossible to find in an easy way. Why do they hide these titles in this way? This entry was posted on Sunday, January 24, 2010 at 9:18 PM and is filed under Atlanta, City Directory, Genea-Tools . You can follow any responses to this entry through the comments feed . I don't know how, but I had more success, Amir. First I went to the US City Directories Database at http://search.ancestry.com/search/db.aspx?dbid=1540. I have it bookmarked in my Quick Links. Then I searched for the surname Tuggle using an Exact search and entered Atlanta in the location. 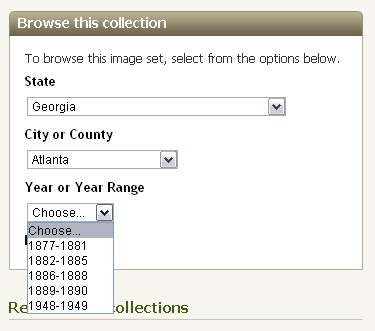 It took a minute, then gave me choices with Atlanta in the location name and I chose Atlanta, DeKalb Co., Georgia, USA. I clicked Search and came up with quite a few results. This was in New Search. Then I went to Old Search by going to the Search tab > Search All Records and clicking on Old Search on the far upper right of the page. I searched again for Tuggle (exact search) in Georgia, Atlanta and came up with 45 results. Miriam, thanks for trying this out. It does seem to work with the location field, but only if you select one of the options Ancestry chooses for you. Strangely enough, it will give the same results for DeKalb and Fulton counties, but it is not intuitive enough for many users. I would like to just enter 'Atlanta' and get all the results, but if I do that I get nothing. Still frustrating to jump through hoops to get to the right images. Thanks again for trying this out.